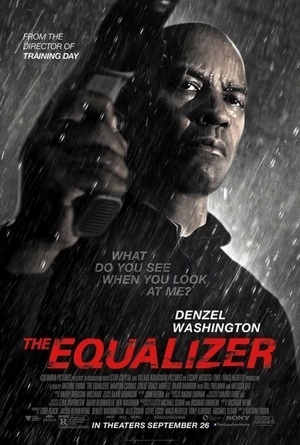 The Equalizer was a television show about a retired black ops agent who volunteers to help people in trouble. It ran in the late 80’s. But you don’t care… nor should you. Because, as I made evident in the title of this post, it doesn’t matter what the name of this movie is or what the plot is. You watched, or will watch, for one reason and one reason only. Denzel Washington is arguably at the top of the list of actors we’ll watch in anything (and justifiably so). Here, he takes on the role of Robert McCall, a former intelligence agent who, in this film, lives a peaceful life working at a hardware store in Boston (the most heinous, corrupt Boston imaginable). His happily meticulous life is interrupted after a teenage prostitute (Chloe Grace-Moretz) he befriends, is brutally beaten by her Russian boss. Avenging her sets off a wave of violence as the Russian Mob comes after him. Denzel Washington has played some badass roles in his long career: American Gangster, Training Day, The Book of Eli are just some off the top of my head. But this role? It’s on a whole different level. Imagine Liam Neeson’s character in the Taken films, but even more skilled. I’m seriously not joking. Washington’s character leaves an even larger body count and rarely picks up a gun throughout the entire film. And he’s more likable too. He’s the perfect person; reading books in honor of his deceased wife, voluntarily helping coworkers better their lives, sticking up for the little guy… hell, I kept expecting him to help an old lady across the street. But it isn’t just the charming likability and the humble toughness of Washington’s character that makes the movie a worthwhile outing. There are several nice little undertones and dramatic moments wedged in there to keep it from being as dumbed down as something Jason Statham would make. The supporting cast is also solid, highlighted most notably by Marton Csokas as Washington’s equally brooding adversary. There may not be an intricate plot or even an adequate amount of worthy challenges for the hero. But, what The Equalizer does give you is a solid superhero, creepy villain-like story with the backdrop of a crime thriller. You’ll have to excuse some action movie clichés, like walking away from a massive explosion in slow motion or the villain methodically walking after prey instead of sprinting. Little moments like that threaten to turn this into a ‘B’ movie, but overall, it’s undoubtedly ‘A’ movie fun to watch. This Post was posted in Uncategorized and tagged Chloe Grace Moretz, Denzel Washington, Film Reviews, Marton Csokas, Movie Critic, The Equalizer. Bookmark the permalink. My pleasure, what’s your favorite Denzel? He’s unreal in everything so it’s tough, I couldn’t possibly name favorite Denzels without Training Day, maybe even Glory and John Q also.